For the first time ever, we’ll turn the searchlight on our most successful and dedicated partner agencies and their employees across Europe and Asia Pacific at the 2019 Regional Bing Partner Awards. It’s their focus to ensure their clients are showing up in all the right places, in all the most impactful ways. On 20 February it is time to give back and honour the passionate work of advertising agencies, technology partners and search professionals. We’ll celebrate the success of all our finalists at the exclusive award ceremony to be held at Westergasfabriek in Amsterdam, Netherlands. The 2019 Regional Bing Partner Awards recognises achievements in 12 categories highlighting the outstanding work of individuals, teams and agencies across the search advertising industry. Our jury of international experts had the extraordinarily difficult task of choosing the finalists out of a record number of submissions. We’re particularly proud to have received this huge number of entries from 10 different markets and to also shine a light on impressive diversity initiatives across the sector with our Diversity & Inclusion Leader Award. Categories and finalists appear below and the list of award categories with detailed descriptions is available on the Bing Partner Awards Website. Awarded to an individual who finds innovative and engaging ways to evangelise Bing Ads, and who drives Bing Ads brand awareness and affinity both internally, and industry-wide. Awarded to an agency leader who has shown true partnership with Bing. This person has excelled in performance over the past year, pioneering ideas resulting in their business’ success. Awarded to an outstanding team (Account Team, Sales or Service Team) that partners, engages, and uses feedback to optimise. They test and adopt new features, and submit case studies, all while staying transparent in the spirit of partnership. Awarded to a rising agency partner, that has shown an exceptional acceleration and growth on the Bing Network. Judges have been looking for a shooting star with inspiring thinking and business solutions, as well as the focus to deliver top results. Awarded to an independent agency that engages with Bing Ads in partnership, grows its Bing Ads spend and product adoption, and exhibits ingenuity and creativity around product application and optimisation. Awarded to the partner demonstrating the strongest commitment to D&I, both in the day-to-day, as well as through specific activities and initiatives. Awarded to a Technology Partner who engages with agencies and Bing Ads in true partnership. Awarded to the Agency with the largest growth of its Bing Ads spend and product adoption in 2018. Congratulations to all our finalists! 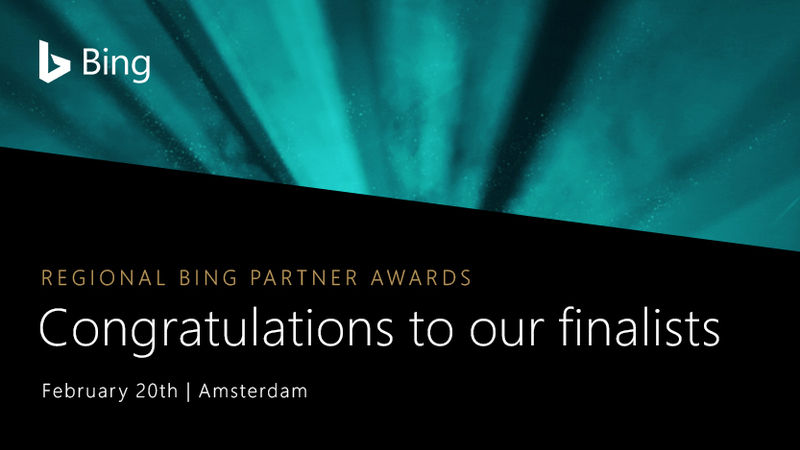 We look forward to announcing the winners at the Regional Bing Partner Awards, which will be held in Amsterdam 20 February 2019.